CMBO is pleased to provide weekly summaries of the Cape's birding highlights. Coverage is limited to sightings in Cape May County. Readers should keep in mind that some reports may not be confirmed. The vast majority of information utilized in these reports comes from eBird data and "Keekeekerr" text alerts. Observers are encouraged to send reports and photos to compiler Tom Reed (coturnicops at gmail dot com). Weather: Overall, the week's weather was fairly tame, with ample sunshine, slightly below average temperatures, frequently breezy conditions, and two brief bouts of rain. The period opened 19 Apr with seasonable and clear conditions, under light and variable winds. A stronger onshore flow developed through 20 Apr, featuring easterly winds with gusts over 30mph at times. These conditions would weaken through 21 Apr, as continued sunshine allowed daytime highs to exceed 60ºF. Winds shifted and increased from the south on 23 Apr, ahead of a strong cold front that arrived later that day. Temperatures topped out in the mid-50s (about 10º below average) on the heels of the front 23–24 Apr, with gusty northwest winds a constant feature both days. The period closed with sunny skies and a strengthening onshore flow 25 Apr, ahead of another front and associated rain showers during the evening hours. Birding Summary: Observers submitted sightings of 191 species during the period 19–25 Apr. This week's arrivals included Sora, Solitary Sandpiper, Gull-billed Tern, Common Tern, Great Crested Flycatcher, Red-eyed Vireo, Yellow Warbler, Black-throated Green Warbler, Summer Tanager, Rose-breasted Grosbeak, and Orchard Oriole. Notable rarities included Eurasian Wigeon, White Ibis, Swallow-tailed Kite, Glaucous Gull, and Black-capped Chickadee. Location Abbreviations: CMP (Cape May Point), CMPSP (Cape May Pt. State Park), SCMM (South Cape May Meadows), SHPt (Stone Harbor Point). Ducks continued to vacate the Cape for points north, but small numbers of Northern Shovelers, American Wigeons, and Green-winged Teal lingered at CMPSP/SCMM throughout the period (m. ob.). A notably late male Eurasian Wigeon remained at the same locations through 25 Apr (m. ob.). Small numbers of Black and Surf Scoters were noted moving east past CMP most mornings (TR, GD, CV et al.). At least one Horned Grebe held on at Hereford Inlet through 25 Apr (TR), while 3 Red-necked Grebes could still be found in the back-bays near Wildwood 19 Apr (VE et al.). 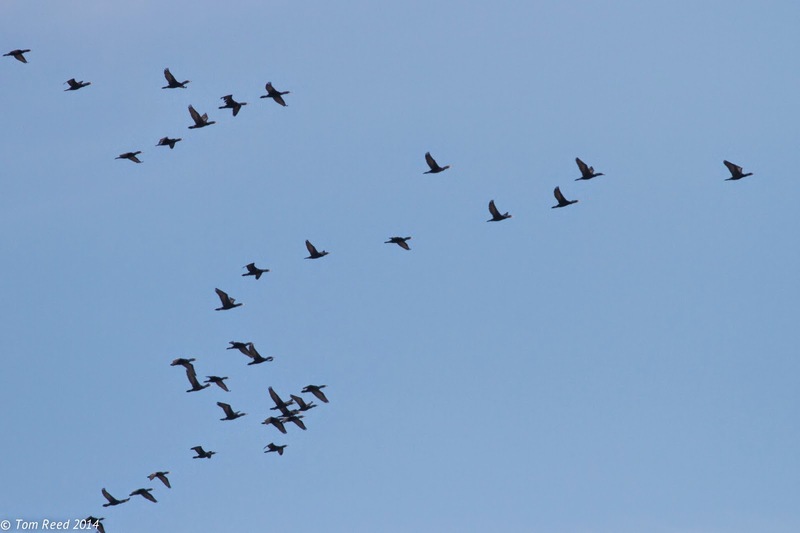 An impressive movement of Double-crested Cormorants included 11,390 tallied from SCMM 22 Apr (TR et al.). At least 3 Cattle Egrets continued to occupy front lawns along New England Road (Cape Island) this week (m. ob.). Glossy Ibis numbers were on the increase this week, and small flocks can now be found in the Delaware Bay marshes. A group of 4 immature White Ibises made for a bizarre sight as they flew north past SCMM 22 Apr (TR). Small numbers of Broad-winged Hawks appeared over Cape Island during days with northwest winds (m. ob.). 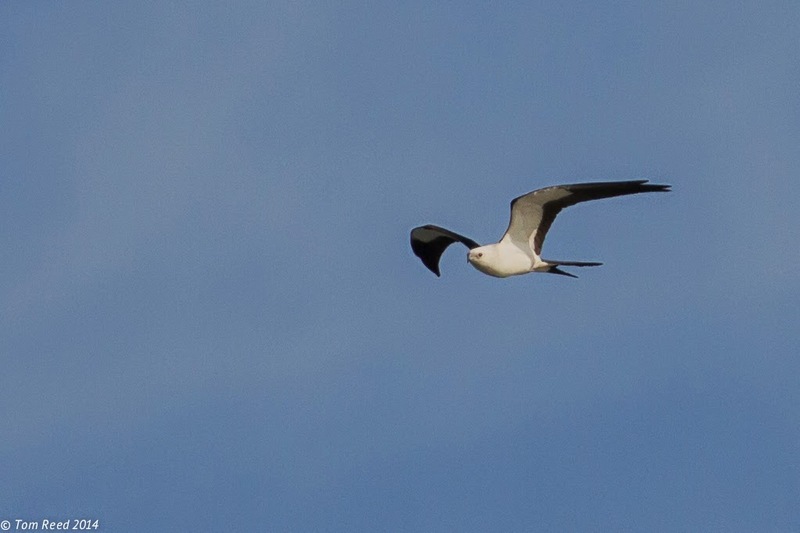 A Swallow-tailed Kite, the county's third of the year, made a brief appearance over West Cape May 19 Apr (TR). The year's first Sora report came from CMPSP 22 Apr (TW). At least 2 American Coots lingered at SCMM throughout the period (m. ob.). The first American Oystercatcher nests were found near Corson's and Hereford inlets 21–23 Apr (fide NJDFW). A very obvious movement of Willets occurred 22 Apr, when 472 were counted flying north past SCMM (TR). A Western Sandpiper was roosting with 200 Dunlin at 117th Street, Stone Harbor on 24 Apr (TR). Stilt Sandpiper is an uncommon spring migrant-- one was at SCMM 25 Apr (TR, m. ob.). A dark-type Parasitic Jaeger was viewed from Coral Avenue, CMP 25 Apr (TR, GD). Lesser Black-backed Gulls continued to be regular at CMP and Hereford Inlet (m. ob.). A scarce bird at any season, a Glaucous Gull dropped in at SCMM 22 Apr (TR) and was subsequently seen at the Coast Guard Base 24–25 Apr (CH). Numbers of Forster's Terns increased through the period. Common Tern arrived at CMP 22 Apr (CV et al. ), and at least one has been seen daily since (m. ob.). A Gull-billed Tern cruised past the Rea Farm/Beanery 25 Apr (VE), while another Royal Tern flew past CMP the same day (TR, KL). CMP's Eurasian Collared-Dove was last noted 19 Apr (m. ob.). 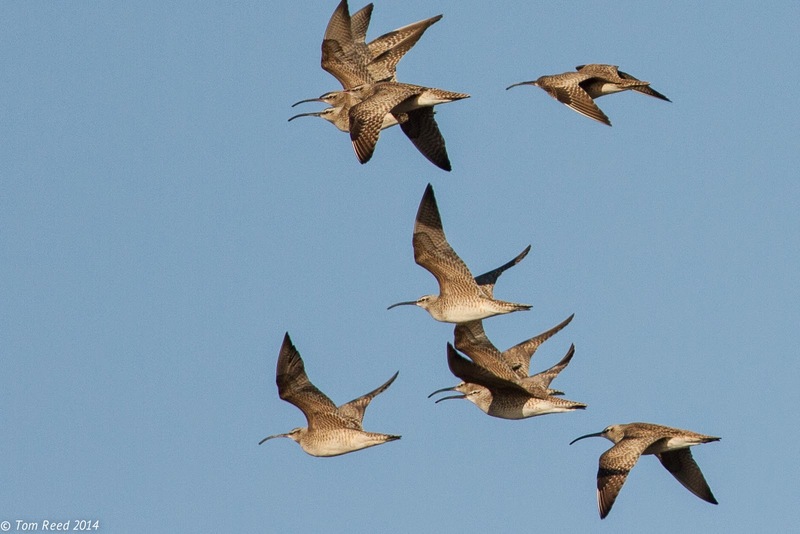 The continued cool weather seemed to put a dent in landbird migration. Ruby-throated Hummingbirds appeared at a few more locations this week, but have been quite slow to arrive overall. Great Crested Flycatcher arrived 25 Apr, when one was noted at SCMM (DH). The year's first Red-eyed Vireo was heard at the Lizard Tail Swamp Preserve 24 Apr (MP). Cape May County's 4th Black-capped Chickadee continued its stay at CMP, last noted in the dunes at Coral Avenue 25 Apr (TR). A very late Snow Bunting was seen again at SHPt 21 Apr (HB). Rare as a spring migrant, an Orange-crowned Warbler was nicely documented at CMPSP 19 Apr (EN). Yellow Warbler arrived at SCMM 22 Apr (TR), while the year's first Black-throated Green Warbler made its presence known at CMPSP 22 Apr (DA). Additional songbird arrivals included Summer Tanager at CMPSP 19 Apr (MU), Rose-breasted Grosbeak at CMP 21 Apr (GD), and Orchard Oriole at Reed's Beach 21 Apr (TR). David Allen (DA), Henry Burton (HB), Glen Davis (GD), Vince Elia (VE), Chris Hajduk (CH), Don Heitzmann (DH), Karl Lukens (KL), Erik Nelson (EN), New Jersey Division of Fish & Wildlife staff (NJDFW), Mike Pasquarello (MP), Tom Reed (TR), Michelle Uhl (MU), Christopher Vogel (CV), Terry Williams (TW). eBird. 2012. eBird: An online database of bird distribution and abundance [web application]. eBird, Cornell Lab of Ornithology, Ithaca, New York. Accessed 25 Apr 2014. Available: http://www.ebird.org. Back on April 12th, I mentioned the two male Eastern Bluebirds that had been brought in to the Northwood Center recently, and they inspired the post on how birds acquire their breeding plumage using various methods. These two bluebirds also gave me an opportunity to study how birds can be aged in the hand because, by chance, they happened to be an adult and a first-year bird. Molt, plumages and all that associated stuff is a pretty turgid subject and, if you want my humble opinion, the subject has been made far harder by the 'boffins' than it really needs to be - at least for most of us. So I'll do my best to keep it simple, but forgive me if it gets a bit convoluted and by all means take your binoculars for a walk half way through if you feel the need! For a variety of reasons, many bird species do not acquire the full-on plumages of adulthood straight away, but tend to build up to it slowly. This is especially noticeable in some of the larger, longer-lived birds such as birds of prey and gulls. There seems to be a pretty obvious set of reasons for this, revolving around the fact that it can take a long time to learn to be good at your craft. This is especially the case with hawks and eagles; there's a lot of skill involved in being able to catch enough food to feed yourself, let alone a whole family of youngsters. So, when the mating season begins, those accomplished adults will be sporting smart and attractive plumages, indicating that they are fit, have done the apprenticeship and are ready to bring up a family. A young bird, in perhaps its second-calendar year, will be recognized as something of a beginner by its plumage and will be far less likely to attract a mate. It's a bit like being a teenager... So young birds can spend the summer practising feeding themselves and not worrying about the stress of maintaining a territory. Indeed, in most migratory species, the sub-adult birds often stay down on the wintering grounds through the first summer and don't even bother to come north. Proving yourself worthy of the job. Many bird species go through often quite elaborate pair bonding procedures which not only help to break down any potentially harmful natural instincts (important in predators especially!) but which also - as in the case with these House Finches at the Hawkwatch Platform this week - help to demonstrate the male's ability to provide for the family. If you see a bird feeding a 'baby' this early in the year, chances are it's actually the male feeding his mate [photo by Mike Crewe]. One other useful thing that a duller, sub-adult plumage does is that it signals to territorial, adult males, that you are not likely to be a threat to them and won't be trying to steal their territories (or wives!) from them. This is especially the case in species like Bald Eagles, where last year's (still brown) youngsters are tolerated in the territory while this year's youngsters are being raised. Songbirds are a little different to the examples given above in that they generally don't live as long, so the whole process needs to be speeded up. In the most extreme cases, the vast majority of individuals of a species will die after the rigors of breeding leaving the year's youngsters to continue the species. This was highlighted to me when I was banding at a coastal observatory in the UK and we found that the overwhelming majority of Goldcrests that we caught as they migrated south in the autumn from Northern Europe were juveniles. So songbirds (or passerines) generally acquire their full adult plumages sooner than the bigger non-passerines, yet there are still clues in most of them that help us to tell the age of the bird. Most of the clues relate to subtle color shades and to shape of feather tips. Here's a sequence of photos of the two male bluebirds that illustrate points that work for many songbird species. Looking at our two unfortunate bluebirds, there's not too much obviously different between them and it is generally the training given while learning to be a bander that allows the subtle clues to be picked up [photo by Mike Crewe]. I'll present the photos in pairs, the upper photo showing the adult, the lower photo showing the first-year (or second calendar year if you prefer). These photos show the tertials - so called because there are three of them and they form the third set of clearly differentiated flight feathers in the wing (the sequence goes primary, secondary, tertial). Notice how, in the bird below, these feathers have much broader, paler edges and tips to them, while the shade of blue is just a little more subdued [photos by Mike Crewe]. 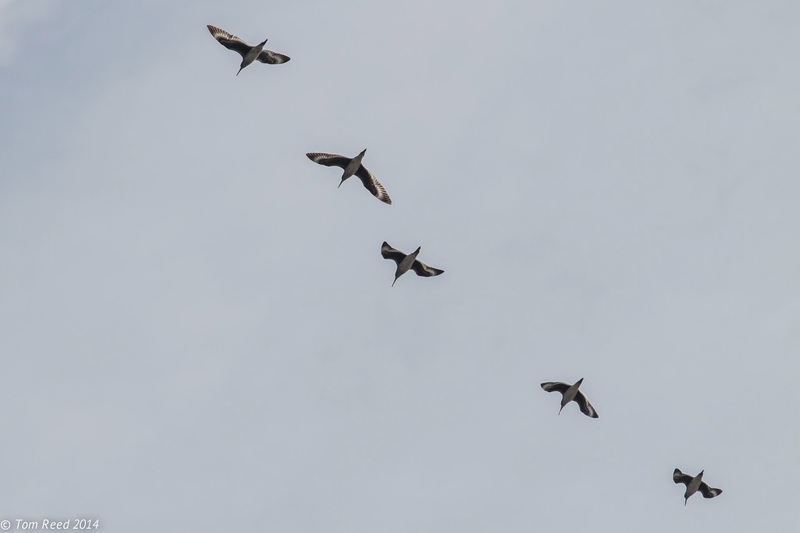 These photos show the greater coverts (running more or less vertically up through the middle of the photo from the bottom) and the primary coverts (above the greater coverts in the photo). In the lower photo, notice that the primary coverts are clearly darker-tipped. More interestingly, notice that the two outermost (top two) greater coverts in the lower photo are duller and grayer than the rest of the coverts. This is because, to save a little energy, many young songbirds don't molt those coverts that sit beneath all the others - and thus get less wear. They will be good for another season. This gives us an easy opportunity to look for this 'molt limit' and use it as a way to tell the age of the bird [photos by Mike Crewe]. Right outer three tail feathers of adult and first-year Eastern Bluebirds. When it comes to tail feathers, it's not the color so much as the shape which helps us to determine the bird's age. Notice that the adult feathers above are generally broader and have neater, more broadly rounded tips. In these examples, the young bird below also shows duller, grayer inner webs, while the adult sports a sharp, white line along the outer edge of the outermost feather [photos by Mike Crewe]. Though much of this detail in subtle and difficult to see in the field, the power of digital photography is opening up all sorts of new opportunities. Zoom in on those spring birds in your yard and see if you can work out what is going on out there! Ready for summer - spiffy birds are all around us at Cape May right now! This pair of Blue-winged Teals has already graced several of our recent walks and given many walk participants an unusual opportunity to get up close and personal with a species that is normally much harder to approach [photo by Mike Crewe]. Eyes were firmly on the skies at Cape May today, as weather conditions came good and presented us with the perfect example of 'visible migration'. 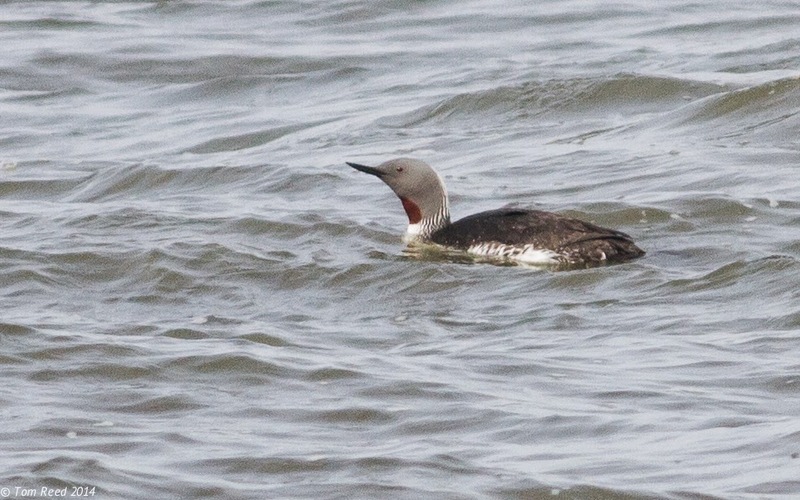 The Cape May SpringWatch led by the unstoppable Tom Reed was a little lackluster first thing, but nevertheless produced a handful of White-winged Scoters among the plentiful Surf Scoters, as well as a mild run of Northern Gannets and Red-throated Loons. Things seemed slow enough to wrap up the count at 08:30AM, but Tom had other ideas. He continued the count from the South Cape May Meadows and a flurry of text messages kept us informed on developments. By early afternoon things were slowing down and Tom reported a count of 11,300 Double-crested Cormorants - all counted heading north over Cape May today. Equally as impressive was the count of 472 Eastern Willets, a much lower count but a very high count for this particular species. Sometimes Cape May is about the rarities but most of the time, it's about the spectacle of migration - and today was a real spectacle. Eastern Willets often fly relatively high when heading north over the Delaware Bay and often travel in small groups. Watch for their snazzy, black and white wing patterns and listen for their far-carrying "wil-let" call. A number of birds were clearly audible as they flew over the Northwood Center today [photo by Mike Crewe]. The movement of large numbers of birds is always a spectacle and ragged, sinuous lines of Double-crested Cormorants are no exception. Over 11,000 passed over Cape May today, heading to breeding grounds further north. More will surely follow in the coming days, creating a wonderful prologue to the amazing sights and sounds of a Cape May spring [photo by Mike Crewe]. If you want to get up close and personal with Double-crested Cormorants and see those amazing aquamarine eyes, jump aboard a Cape May boat trip and enjoy them for yourselves! These birds were part of a resting flock at Cold Spring Inlet this weekend [photo by Mike Crewe]. While our impatience to head full tilt into the heady days of May has a tendency to make April seem a little dull at times, I was pleasantly surprised recently when I reviewed the list of birds that had been recorded in Cape May over the past week or so and found it to be much higher than I had thought. Sifting through a hotch potch of bird photos, I discovered a common theme that brought them together - there's a lot of birds flying over our ponds and back bays right now - and even out over the bay and ocean. This year, the chilly weather of the past winter doesn't seem overly keen to leave us and it is still easy to travel around Cape May and find more birds lingering from the winter than arriving for the summer. Despite this, the county is gradually greening up, CMBO's walks program is now fully under way and great birding adventures are here for the taking. Today saw the last of our early spring Loons and Shorebirds Cruises (fear not, there are still plenty of boat trips to come!) and there was an excellent range of birds scattered throughout the back bay marshes. Boat trips give excellent opportunities to get closer to birds that otherwise would remain distant, out in the middle of the back bays and it was these opportunities that gave me a good collection of flight shots to post here. The annual spring spectacle of Northern Gannets passing northward will continue for perhaps another couple of weeks and watching the Delaware Bay from Cape May Point during pretty much any morning in April should provide you with plenty of activity [photo by Mike Crewe]. Check out the various ponds around Cape May Point or at Cox Hall Creek WMA during duller spells of weather and you should find a good collection of swallows and martins hawking insects low over the water. The insects drop lower during overcast conditions, forcing the birds to feed lower too. This Barn Swallow was showing off its snazzy tail and rusty underparts on our walk at The Meadows on Friday [photo by Mike Crewe]. Something of a surprise addition to our Meadows walk was this adult Bonaparte's Gull which was hawking insects over the main ponds there. This species winters with us in good numbers but most individuals have already headed northward before they get the dark hood of breeding plumage, so this bird was a pleasant surprise here [photo by Mike Crewe]. Not all wings over the water are a welcome sight in Cape May. Mute Swans, introduced to North America from Europe, are unarguably beautiful birds, but their persistently aggressive behavior and voracious appetite for native wetland plants makes them seriously detrimental to the health of our wetlands. While some states have shown maturity in tackling the problem head on, New Jersey continues to ignore its responsibility to the health of our wetland habitats and numbers of Mute Swans are rising worryingly here [photo by Mike Crewe]. Good numbers of wintering Brant remain in our back bays now and can be enjoyed at close range on a boat trip. Numbers of this species continue to recover from earlier population crashes and this is now a common species at some coastal saltmarsh locations. In this flight shot, look for the pale tips to the wing coverts, forming narrow white lines across the inner wing on some birds. These markings are indicative of last year's youngsters; birds with all dark wings are adults [photo by Mike Crewe]. Double-crested Cormorants pass through Cape May in great abundance during April and early May and are now acquiring their smart breeding plumage. Many waterbirds also have color changes in their bills and other unfeathered areas - note the speckled bill, brilliant green eye and glowing yellow throat of this bird [photo by Mike Crewe]. Another late hanger-on, Red-breasted Mergansers were pretty common around Jarvis Sound today, but all but a handful of stragglers will leave over the next few weeks [photo by Mike Crewe]. A reminder of the harsh winter experienced to the north of us this year, Red-necked Grebes can still be found in Cape May's back bay wetlands and we saw four on today's boat trip - including this one which was trying that old walking on water trick in Cape May Harbor [photo by Mike Crewe]. Also a hang-over from the winter period, one or two Horned Grebes (like this one on Sunset Lake today) remain and are now well into their breeding finery. This shot shows just how grebes are so highly adapted to swimming and why they have so much trouble trying to walk - their feet are set right at the back of the body and project noticeably in flight [photo by Mike Crewe]. But its not all departures, as demonstrated by these newly-arrived Eastern Willets today. Willets are rather plain-looking birds when stood on the ground but, launching themselves into the air, they reveal a startling black and white wing pattern [photo by Mike Crewe]. Day by day, almost minute by minute, you can feel the excitement and urgency of spring. It takes a lot to beat a busy spring day at Cape May when the migrants are in town! Weather: The period began with mild conditions on 12 Apr, under a strengthening southerly flow. Strong and persistent south winds continued through 13–14 Apr, along with mild conditions and patchy sunshine. A strong cold front approached the Cape during the early-evening hours on 15 Apr, bringing with it heavy rain showers. Winds quickly shifted to the northwest through the overnight hours of 15–16 Apr, with near-record lows noted during the early AM 16 Apr. Temperatures stayed well below average 16–17 Apr, as winds shifted to the east under a low overcast. The period ended with continuing cool conditions and cloudiness, as temperatures struggled to top 50ºF on 18 Apr. Birding Summary: Observers submitted sightings of 182 species during the period 12–18 Apr. This week's arrivals included Short-billed Dowitcher, Parasitic Jaeger, Ruby-throated Hummingbird, Blue-headed Vireo, Ovenbird, Prothonotary Warbler, Hooded Warbler, and Prairie Warbler. Notable rarities included Harlequin Duck, Black-headed Gull, Cave Swallow, Black-capped Chickadee, and Painted Bunting. Location Abbreviations: BSF (Belleplain State Forest), CMP (Cape May Point), SHPt (Stone Harbor Point). Waterfowl numbers continued to drop off. Northern Pintail went unreported this week, and other species such as Northern Shoveler, Ring-necked Duck, and Green-winged Teal also decreased. The "Eurasian" Green-winged Teal was also apparently not seen. A male Eurasian Wigeon put on a nice show at Lighthouse Pond, CMPSP on the relatively late date of 18 Apr (VE, m. ob.). A female Harlequin Duck was a pleasant surprise at Sunset Beach 15 Apr (GDa, m. ob.). Surf Scoters were detected moving out of Delaware Bay from CMP on several mornings, with a peak flight of 1,206 on 14 Apr (TR et al.). Red-necked Grebes continued to thin out-- the most recent reports included 2 at Cape May Harbor 15 Apr (CH), 1 at Cox Hall Creek WMA 17 Apr (m. ob. ), 1 near Wildwood 18 Apr (VE et al. ), and 1 at SHPt 18 Apr (TR). Multiple Yellow-crowned Night-Herons continued to be found at 44th Street, Avalon through the week (m. ob. ), and 3 Tricolored Herons were at Nummy Island 16 Apr (m. ob.). At least 4 Cattle Egrets were seen along Route 9 in Swainton on 18 Apr (GDw). At Cape Island, 1-2 Cattle Egrets took up residence along Bayshore and New England Roads throughout the week (m. ob.). Broad-winged Hawk was seen at CMP on several days, with a max of 5 on 18 Apr (m. ob.). The species was also noted at BSF this week, where it presumably breeds. Nummy Island was home to 57 Whimbrel, 15+ Short-billed Dowitchers, and a Red Knot on 16 Apr (m. ob.). A Pectoral Sandpiper flew over CMP 16 Apr (MC, m. ob.). The year's first Parasitic Jaeger flew north past CMP 18 Apr (GDa, TR). A Black-headed Gull at High's Beach 13 Apr could have been the last of the season (WK). Lesser Black-backed Gull continued to be regular at CMP through the week, with a max of 6+ on 16 Apr (m. ob.). Royal Terns were noted again this week, with 2 seen at CMP 13 Apr (TR et al.). A single Eurasian Collared-Dove remained at CMP through 18 Apr. Sightings in the past week have come from Harvard Avenue, Coral Avenue, and West Lake Drive (m. ob.). Snowy Owl apparently went unseen this week-- additional sightings are greatly appreciated. The spring's first Ruby-throated Hummingbird zipped past CMP 12 Apr (TR et al. ); another was at a feeder in Cape May Court House the same day (JA). There were daily sightings of Eastern Kingbird at CMP (m. ob. ), and the first migrant Blue-headed Vireo was detected at BSF 13 Apr (MF). Very rare in spring, a Cave Swallow was found within a large group of swifts and swallows at Lily Lake, CMP 18 Apr (CV, m. ob.). There are only a handful of spring records for this species in New Jersey. At least 12 Cliff Swallows were tallied at CMP 16 Apr, likely a product of the strong northwest winds (m. ob.). Cape May County's 4th Black-capped Chickadee lingered at CMP through 18 Apr (m. ob.). An obvious movement of Blue-gray Gnatcatchers 13 Apr included 30+ at CMP (m. ob.). A very late Snow Bunting was a curious sight at SHPt 17 Apr, and may be the second latest on record (TR). Prothonotary Warbler (m. ob.) and Prairie Warbler (SW) arrived at the Rea Farm/Beanery 12 Apr. Ovenbirds appeared at BSF the next day (m. ob.). 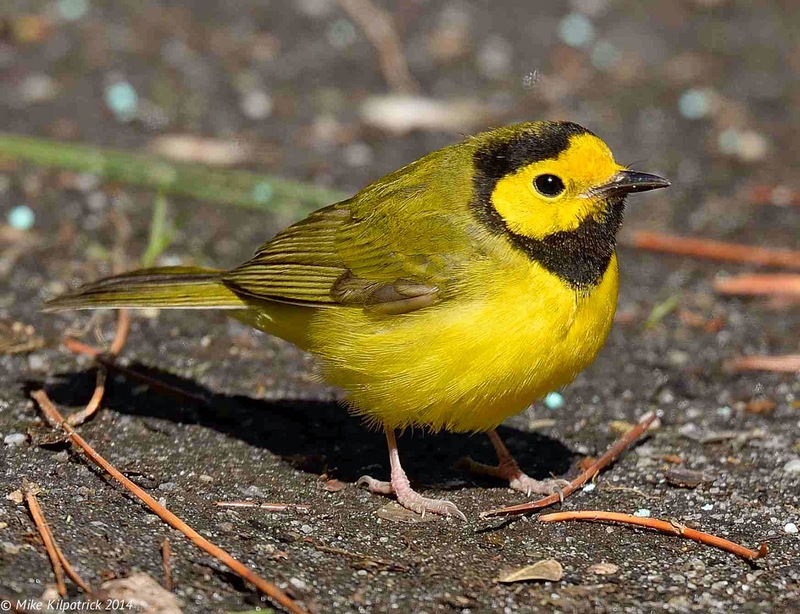 A Hooded Warbler was photographed near the Hereford Inlet Lighthouse at North Wildwood 16 Apr (MK, fide JS). Vesper Sparrow is a scarce spring migrant in Cape May County, so one at the Rea Farm/Beanery 13–16 Apr (VE et al.) was notable. The spring's first Blue Grosbeak flew past Coral Avenue, CMP 16 Apr (DG, TR). The Painted Bunting continued at 113 Harvard Avenue, CMP through at least 14 Apr (fide GDa). There were no reports of the Eurasian Tree Sparrow this week, despite many hours of searching. Jesse Amesbury (JA), Mike Crewe (MC), Glen Davis (GDa), Gail Dwyer (GDw), Vince Elia (VE), Mike Fritz (MF), Doug Gochfeld (DG), Chris Hajduk (CH), Will Kerling (WK), Mike Kilpatrick (MK), Tom Reed (TR), Joe Smith (JS), Christopher Vogel (CV), Sam Wilson (SW). eBird. 2012. eBird: An online database of bird distribution and abundance [web application]. eBird, Cornell Lab of Ornithology, Ithaca, New York. Accessed 18 Apr 2014. Available: http://www.ebird.org. In the natural world, spring brings with it many things - warmth, lushness, regeneration and - often - rich colors. We are all used to seeing somewhat drab-looking birds in spring, that miraculously become bright and colorful in spring, ready for the forthcoming breeding season. How do they do this? Well, this very subject came to mind with me recently when Jim Cremer brought two dead Eastern Bluebirds into the Northwood Center. While such an event is of course tinged with sadness for the two bluebirds, it does give a rare opportunity to study birds closer and to learn more about them. I studied two things on the two bluebirds - the transition from non-breeding to breeding plumage and the difference between first-year and older birds. I'll cover the latter subject at a later date, but acquiring the colors of spring is what we will look at here. Birds are an amazing study in evolutionary processes. To be able to fly, they need to be as light as possible, while still covering all the other essentials of life - breeding, keeping warm, staying alive! They have developed feathers which are very light and open structured, yet keep them warm. These feathers have then evolved to serve as seasonal queues to each other - a male in full breeding plumage says to another male 'stay off my patch' and says to a female 'I'm fit and well and able to support a family'. But there's a pay off; feathers are relatively weak, so damage and wear out relatively easily compared with the fur of mammals or the harder skin coverings of reptiles. To compensate for this, birds molt - switch out their old feathers for new ones. A close up photo of the feathers on the mantle of an Eastern Bluebird reveals blue feathers with dusky, brownish tips. In winter, these brownish tips are extensive and overlap, in some individuals almost completely masking the blue underneath. As the season progresses, these loose, open tips gradually wear away to reveal the glorious blue - and hence the bird comes into breeding plumage without having to molt [photo by Mike Crewe]. In the field, it is possible to see this dusky-fringed effect and thus work out which species use this process. The Northern Cardinal is a classic example, as seen here. Note the gray fringes to the mantle feathers; earlier in the winter these fringes can be much more extensive than on this bird, which was photographed in late winter [photo by Mike Crewe]. The alternative to acquiring breeding plumage by abrasion is to feed up well and go through two molts a year (pretty much all birds go through one full molt a year at least, usually in late summer after the stress of the breeding season). So how do we tell these birds from the abrasion ones? 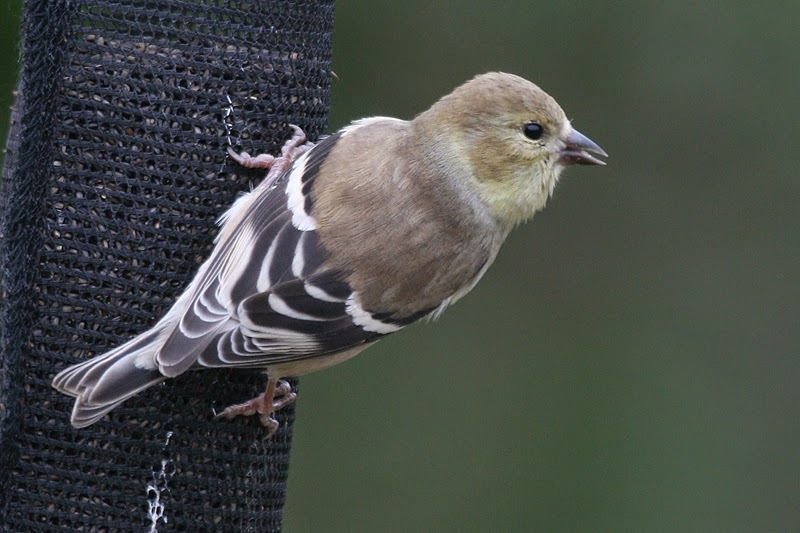 American Goldfinch is a classic example of an easily-studied species that acquires breeding plumage by molt. Here's a typical, rather drab-looking goldfinch in winter [photo by Mike Crewe]. 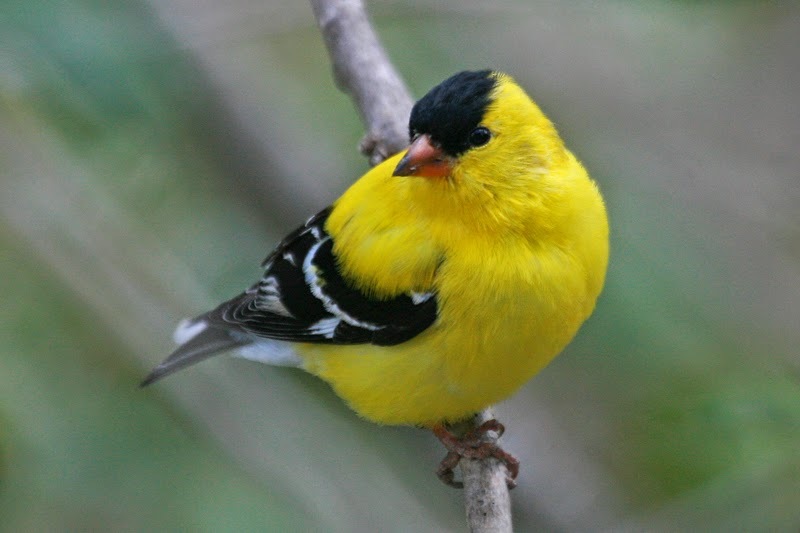 By late winter/early spring, you will start to see some American Goldfinches looking like this. This male goldfinch is gradually replacing the brown of winter with the gold of summer and the result is not a bird with neat, regular patterning, but a rather blotchy looking individual with a mix of the two plumage colors [photo by Mike Crewe]. 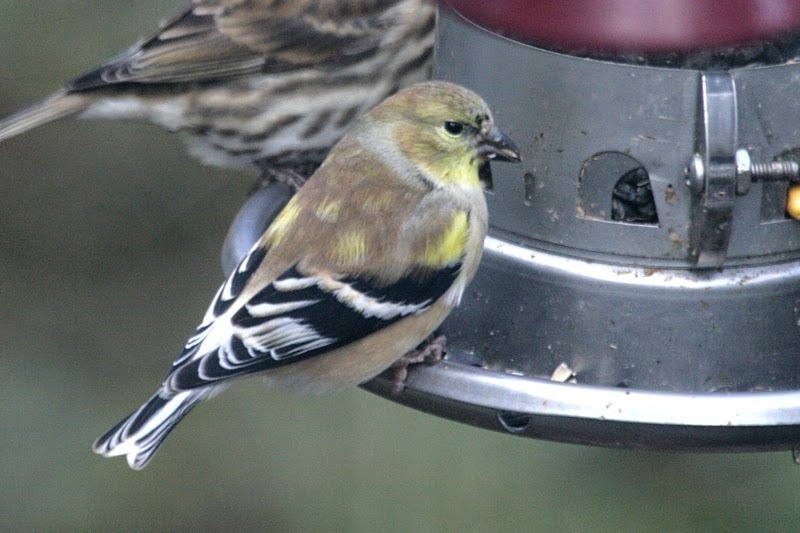 A little further into spring and we can see a male American Goldfinch emerging - the black cap is starting to show now and yellow is coming on the underparts [photo by Mike Crewe]. Another common bird that acquires breeding plumage by abrasion is the European Starling. 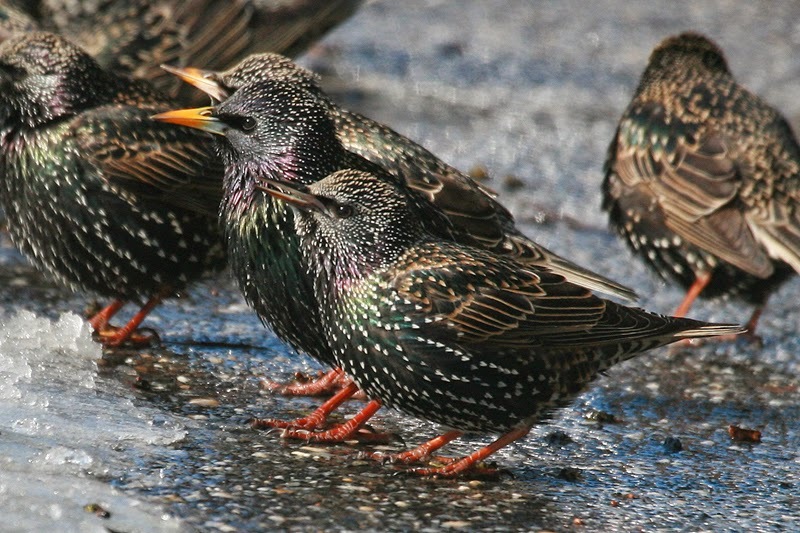 These spangled winter birds will lose those white tips and turn into mostly black birds with glossy green and purple reflections. One other change that takes place in many birds is a change in bill color. Note here that the front bird (sexed as a female by the pale eyering) still has a dark bill, while the two behind have yellow bills, indicative of breeding condition. Though hard to see on this reduced, web version, you might just notice that the nearer bird has a bluish base to its yellow bill, indicating a male, while the bird behind has the pink base of a female [photo by Mike Crewe]. If you still have your back yard feeders out, check out the species that come in regularly and see if you can tell the abraders from the molters as spring progresses! Weather: The period began with seasonable and clear conditions 5 Apr, with gusty northwest winds. Winds weakened through 6 Apr under continuing sunny skies, and a light southerly breeze took hold during the overnight hours 6–7 Apr. Winds again shifted, this time to the east, and increased through the daylight hours of 7 Apr, ahead of a warm front that produced some rain showers during the evening hours. Pleasant weather returned for 8–9 Apr, courtesy of ample sunshine and a steady breeze out of the west. A southerly flow developed during the second half of 10 Apr and strengthened through 11 Apr, bringing with it the year's first 70ºF day. Birding Summary: Observers submitted sightings of 177 species during the period 5–11 Apr. This week's arrivals included Sooty Shearwater, Cattle Egret, Green Heron, Upland Sandpiper, Whimbrel, Pectoral Sandpiper, Royal Tern, Eastern Whip-poor-will, Chimney Swift, Eastern Kingbird, Bank Swallow, House Wren, Louisiana Waterthrush, Worm-eating Warbler, Black-and-white Warbler, Common Yellowthroat, Northern Parula, and Indigo Bunting. Notable rarities included "Eurasian" Green-winged Teal, Swallow-tailed Kite, Northern Goshawk, Sandhill Crane, Black-headed Gull, Snowy Owl, Pileated Woodpecker, Painted Bunting, and Eurasian Tree Sparrow. Waterfowl numbers finally saw a significant decrease this week. There were no reports of Redhead, the lingering Tundra Swans and Canvasbacks departed CMP 6 Apr, and Snow Geese have apparently gone missing from the bayshore marshes since 5 Apr. A female Eurasian Wigeon appeared at SCMM 9 Apr (CV), but there were no reports of the species along Ocean Drive this week. The "Eurasian" Green-winged Teal continued to put in sporadic appearances at CMPSP, last noted from the east end of Lighthouse Pond 11 Apr (MP). A strong waterbird movement past CMP during the AM hours of 11 Apr included 831 Surf Scoters, 13 White-winged Scoters, 356 Red-throated Loons, 71 Common Loons, 3,238 Northern Gannets, and 1,841 Double-crested Cormorants (TR et al.). An early Sooty Shearwater was seen from CMP the same day (CV et al.). Red-necked Grebes continued to thin out-- reports included 7 near the Ocean Drive fish docks 5 Apr (MP), 1 at Cape May Harbor 8 Apr (SW), and 3 at Champlain Drive, Villas 10 Apr (TM). A total of 14 Yellow-crowned Night-Herons could be found at 44th Street in Avalon 9 Apr (m. ob. ), while Tricolored and Little Blue Herons became increasingly regular at Nummy Island through the week (m. ob.). The year's first Green Heron dropped in at SCMM 8 Apr (MP); the first Cattle Egret was reported from Route 9 in Swainton on 11 Apr (SG). 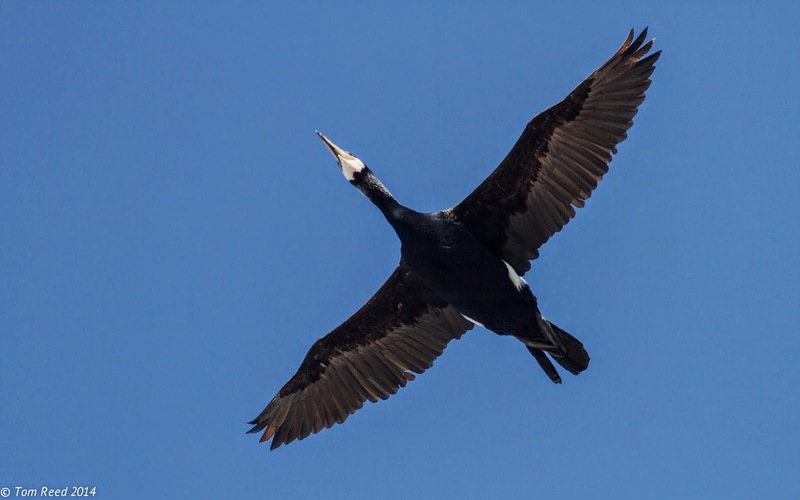 [Great Cormorants have been seen recently at CMP and Nummy Island. Osprey continued to filter in on a daily basis. Many nesting platforms along both the Atlantic Coast and the Delaware Bayshore now host returning pairs. Northern Goshawk is a very rare spring migrant, but that didn't stop an imm. from flying over Jake's Landing 10 Apr (CS). A Swallow-tailed Kite flew past SHPt during the strong westerlies of 5 Apr (TR). It was last seen continuing north over 30th Street, Avalon (GDw). Those same westerlies were likely responsible for the Sandhill Crane that passed over CMP 6 Apr (GDa, MC et al.). Black-bellied Plovers were on the move this week, illustrated by 12 migrating past SHPt 8 Apr (TR) and a total of 92 on the flats at Norbury's Landing 10 Apr (TF). The first noticeable push of Willets occurred 11 Apr, when 38 migrated north past CMP in small flocks (TR et al.). 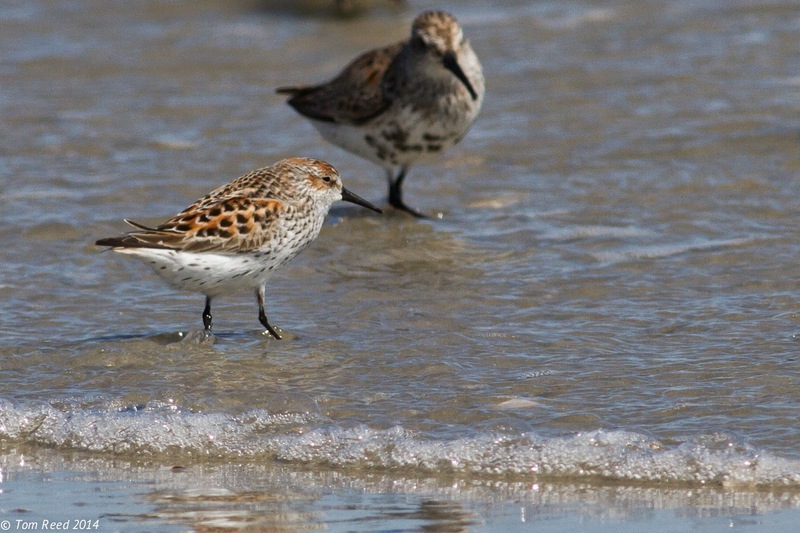 A group of 3 Western Sandpipers at 120th Street, Stone Harbor 8 Apr were apparently recent arrivals (TR). There were very few sightings of the species in the county this winter. Another likely arrival was the single Red Knot roosting at Nummy Island 9 Apr (m. ob.). Whimbrel made its first appearance of 2014 at Nummy Island 6 Apr, a slightly early date (TB, MP). An increasingly rare spring migrant, one Upland Sandpiper was calling as it flew over SHPt 11 Apr (TR). A bit more expected were the two Pectoral Sandpipers photographed at the Higbee Dike 8 Apr (MP). At least two Black-headed Gulls remained along the lower Delaware Bay this week, with sightings of 1-2 birds at Miami Avenue in Villas, as well as Pierce's Point (m. ob.). Laughing Gull "officially" arrived this week-- 1,180 migrated past CMP 6 Apr (MC, GDa) and a minimum of 2,500 could be seen and heard at Nummy Island 9 Apr (m. ob.). Lesser Black-backed Gulls were regular at CMP and SHPt through the week (m. ob.). Numbers of Forster's Terns increased daily, and the season's first Royal Terns entertained birders at CMP 11 Apr (CV et al.). A single Eurasian Collared-Dove stayed at CMP this week (m. ob.). The neighborhoods bordered by Coral, Harvard, Lehigh, and Lincoln Avenues are typically the best places to search for the dove. SHPt continued to host 2 Snowy Owls through 6 Apr (TR), and at least one lingered through 10 Apr (m. ob.). 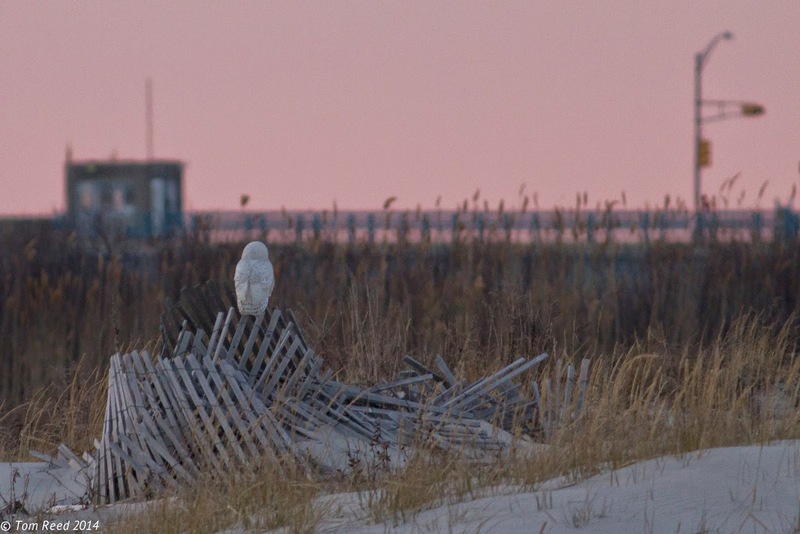 A Snowy Owl also remained along the Avalon beachfront until at least 10 Apr (TR), while another was reported at Congress Hall in Cape May City 5 Apr (fide MO'B). The spring's first Eastern Whip-poor-will was audible at Jake's Landing 11 Apr (KJ, BJ). Bank Swallow arrived near Cold Spring 6 Apr (TR), and Chimney Swift arrived at CMP 8 Apr (TR et al.). The Black-capped Chickadee was apparently not seen at CMP this week (fide GDa). A Pileated Woodpecker was an exciting find at CMP 6 Apr (GDa, m. ob.). Most Cape Island sightings of this species have occurred during Apr and May. A small flight of American Kestrels and Merlins was visible along the barrier beaches 5 Apr (m. ob.). CMP's first Eastern Kingbird of the year flew past on 11 Apr (RC et al.). White-eyed Vireo appeared at multiple locations on Cape Island 11 Apr (m. ob. ), and House Wren arrived at CMP 11 Apr (MP, GDa). Multiple warbler species also returned 11 Apr-- Black-and-white and Worm-eating at Belleplain State Forest (JA), Northern Parula at CMP (MC), and Common Yellowthroat at SCMM (MP). Yellow-throated Warbler, Pine Warbler, and Louisiana Waterthrush filled appropriate habitat at Belleplain State Forest through the week (m. ob.). An Indigo Bunting fed in the dunes at CMPSP 10 Apr (CV). Finally, the Painted Bunting continued at 113 Harvard Avenue, CMP through at least 9 Apr, and the Eurasian Tree Sparrow was also noted here the same day (m. ob.). Jesse Amesbury (JA), Tom Baxter (TB), Mike Crewe (MC), Richard Crossley (RC), Glen Davis (GDa), Gail Dwyer (GDw), Tim Freiday (TF), Sam Galick (SG), Brian Johnson (BJ), Karen Johnson (KJ), Tom McParland (TM), Michael O'Brien (MO'B), Mike Pasquarello (MP), Tom Reed (TR), Clay Sutton (CS), Christopher Vogel (CV), Scott Whittle (SW). eBird. 2012. eBird: An online database of bird distribution and abundance [web application]. eBird, Cornell Lab of Ornithology, Ithaca, New York. Accessed 11 Apr 2014. Available: http://www.ebird.org. One of our local, bullyboy Bald Eagles came steaming in to relieve the Osprey of its meal - but the Opsrey got a reprieve when the eagle pulled up and dropped down onto the beach. When I went to investigate, I found that the Baldie had decided to scavenge a dead skate from the tideline. Fog and early morning means very poor light and consequently very poor photographic conditions. Still, I couldn't resist getting at least some record shots of something you don't see all that often around Cape May - a Horned Grebe in breeding plumage! Of six birds that flew past on the SpringWatch count last Saturday morning, three of them were in breeding plumage. This bird was feeding actively off Cape May Point on Sunday morning and shows how the black and white of winter is replaced by rich chestnut with golden head plumes [photo by Mike Crewe]. With the forecast of a chilly, northerly wind making prospects for today seem not overly promising, it looked as though birding Cape May Point might be something of a challenge today. Starting a Cape May SpringWatch count at a little after 06:30 this morning I was therefore pleasantly surprised to see plenty of birds ferrying up and down the Delaware Bay. A three-hour count this morning eventually turned in a count of over 1100 Laughing Gulls heading north, making it the first really big push of this species so far this spring. With them came a scattering of Forster's Terns and Bonaparte's Gulls, the beginnings of a serious northward push of Double-crested Cormorants and a continuing build up of Red-throated Loons in The Rips. Passerines came today also; small numbers of Barn and Tree Swallows trickled along the beach, Pine and Palm Warblers moved through the dunes and dune scrub and interest came in the shape of a couple of Wood Ducks, Bald Eagle, Sharp-shinned Hawk, six Horned Grebes (three of which were in full breeding plumage) and the addition of three Lesser Black-backed Gulls to the local collection of American Herring and Ring-billed Gulls. But it was Glen Davis who was to have the luck today - though a handful of us were lucky enough to share his finds. Driving through the streets of Cape May Point, Glen spotted a Pileated Woodpecker which crossed the road in front of him. Within seconds he had alerted me to the bird and, just a few minutes later, I caught sight of this magical bird as it rose high above the houses. As always seems to be the case on such occasions, my camera's autofocus decided to have an off day and I singularly failed to record the moment. Glen returned shortly after and together we watched the bird sneak back across the road (I got a perfectly-focused photo of telephone wires with a mysterious smudgy blob in the middle) and disappear behind the houses. The bird was later seen by one or two observers near Lighthouse Pond at the state park and later still at The Beanery. Maybe it will be around tomorrow. Being out in the field for Cape May SpringWatch had paid off - and we were shortly to be rewarded again when Glen spotted a Sandhill Crane cruising slowly away from us. It's unclear where this bird had suddenly come from, but it seems likely that it had arrived from the north, spotted the bay ahead and decided to turn back the way it had come. Quite a start to the day and a clear sign that birds are really on the move in our area now. I rounded off the day with a Louisiana Waterthrush singing in woods on the east side of Lighthouse Avenue around 7PM. It then came into the Northwood Center woods and called for a short while before flying back across the road again. A pretty typical date for this species and a sign that Belleplain State Forest will seen be busy with breeding warblers. The two Tundra Swans that had been hanging out at the Plover Ponds also seem to be getting itchy feet as they flew north over the Northwood Center this evening, yapping like small dogs. Every moment in the field counts from now on - it's time to get out and get recording, logging your observations for the future and helping us build a better picture of what our birds are up to. After an absence long enough to make most of us feel that it had moved on, the Eurasian Tree Sparrow turned up at the Cape May Point feeders again on Saturday and continued to spend time on Harvard Avenue today [photo by Mike Crewe]. Out with the old - dainty Bonaparte's Gulls can be seen skipping along the wave tops as they head north up the Delaware Bay now. These birds have wintered with us and are now beginning their journey northward to the boreal forests of Canada to breed [photo by Mike Crewe]. In with the new - having wintered in milder climes to the south, Eastern Phoebes are now returning to breed with us. Look for them along open field edges such as at Higbee Beach, The Beanery or Cox Hall Creek WMA [photo by Mike Crewe]. Northern Gannet numbers have yet to really get going this year - perhaps the cold winter had pushed them further south than usual. But a few are passing through the bay now and the gray backdrop of Saturday morning's foggy start set them off a treat [photo by Mike Crewe]. Famous for never being able to keep a straight line for long, packs of Double-crested Cormorants are now trickling in over Cape May Point. This trickle will become a flood pretty soon and this species is a real icon of visible migration along the eastern seaboard [photo by Mike Crewe]. And it's not just birds that are stirring from the winter doldrums. This Striped Skunk was ambling along looking for a good meal near Lake Lily a few days ago - you need a peg for the nose to get close shots of these guys.... [photo by Mike Crewe].